When Facebook rolled out Timeline, they opened up new opportunities for organizations to showcase their brands visually, including the new cover photo. It's the perfect spot for a big, juicy graphic to offset the small, usually logo-dominated main page photo. Lots of nonprofits, associations and institutions have taken advantage of the Timeline cover photo, some changing it with the seasons and holidays, some showing various aspects of their brand. 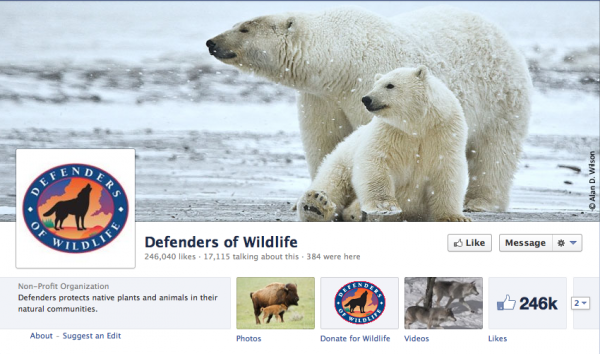 Check out 18 fantastic Facebook Timeline cover photos below. The Special Olympics Facebook page uses a great action shot to convey excitement and optimism. It really engages the viewer. ASHA uses a creative “bubbles” background to show the variety of things they do. The risk of using a photo collage is a cluttered, scattered look, but this arrangement balances the graphical elements in a pleasing way. ONE uses a photo with an Instagram-like, retro filter and an inspirational quote from the rock star Bono — an ideal combo for their primary audience of young adults. MOAA uses a tense action shot to convey the importance of support for military personnel. The George Washington University cover photo uses a neat fisheye lens shot of a colorful, student-decorated wall on campus, showing that they care about their students. The American Heart Association uses a children’s drawing to tie in with Congenital Heart Defect Awareness Week. Changing your cover photo regularly gives your page a fresh look and makes people want to visit your page more often. The AMA has a bold but beautifully-arranged collage of images demonstrating the people and governmental bodies with whom they work, with their tagline running along the bottom of the image. The United Church of Christ changes their cover image with the church calendar. This minimalist graphic is a great choice for the introspective season of Lent. The Sydney Aquarium does a super job highlighting attractions at their facility. 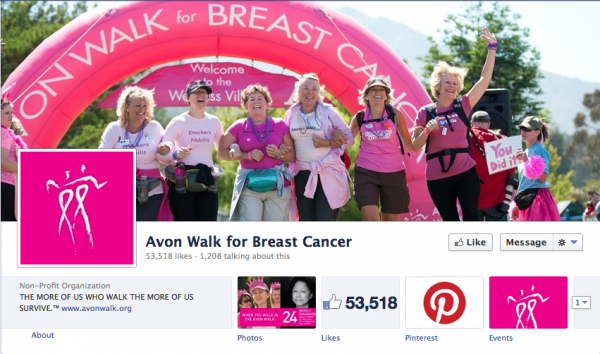 The Avon Walk for Breast Cancer has a great shot of triumphant walkers working as a team, giving the viewer a sense of both the fun and importance of the event. Greenpeace International uses their cover image, in conjunction with their profile image, to highlight a current action alert. EMILY’s List shows off the women they have worked to get elected to state and national offices. It gives the viewer a real sense of the important accomplishments the organization has worked toward. Children’s National Medical Center uses a hopeful, cheerful image taken in their facility, giving them a warm and friendly look. Defenders of Wildlife uses a beautiful shot of a parent and child polar bear, matching well with the current winter season. The United Nations Foundation has a great image of smiling faces greeting their visitors, contrasting with the text-based graphic used for their profile image. 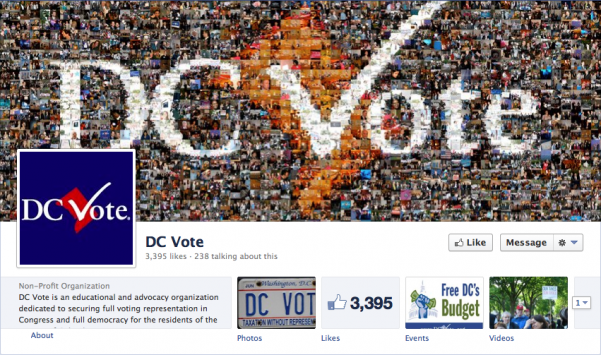 DC Vote uses a great photo montage to remind the viewer of all the people invested in DC voting rights. The Guggenheim features an arty shot from the inside of their iconic museum, which focuses on both the unique architecture and the visitors enjoying the works of art. The Smithsonian uses an exciting, celebratory image of fireworks behind their main office building (which was the original Smithsonian museum). Did I miss any good ones? Post links in the comments, so we can all learn from each other!